The all-terrain vehicle (ATV), also known as three and four-wheelers, was initially developed in Japan as a farm -to- town vehicle in isolated, mountainous areas. During spring thaws and rainy seasons steep mountainous roads were often impassable with conventional vehicles. The three-wheeled ATV proved to be a much better mode of travel and soon became a recreational vehicle, providing transportation to areas inaccessible by other motorized transport. And, it wasn't long before the Japanese manufacturers realized that the ATV could be sold to Americans. When the ATV first appeared in the United States in the early 1970's, it was promoted and sold as a recreational vehicle designed to provide "thrills" for the rider. This is still its primary use today. Shortly, however, sportsmen found that the ATV was a useful machine to move through areas not accessible with pick-up trucks, four-wheel drives, or other motorized vehicles. The ATV became popular as a hunting vehicle and was used to reach remote areas and to transport game back out. Three decades ago, the first ATV, Honda's US 90, had a single-minded purpose: off-road recreation. But as Honda's family of ATVs grew, so did their usefulness. Ironically, it was market strategy that at first drove ATV usage, but it was the owners who found and invented new and creative applications for ATVs, and helped shape their growth and design along the way. What these hard-working owners found out was that the ATV offered a stunning versatility even Honda engineers never dreamed of. Less expensive to operate than a pickup or tractor, smaller and more maneuverable than either one, and possessed of a remarkably light footprint (with their low-pressure tires) that was easy on sensitive terrain, ATVs became vital tools in such widely divergent fields as farming, ranching, industry, all types of agriculture, police work-even as a crucial means of mobility for the disabled. In some cases, ATVs did jobs no other vehicle could, making the impossible possible. If necessity was the mother of the first ATV, Honda engineer Osamu Takeuchi was its father. In 1967, American Honda asked Honda R&D Ltd. for a new product dealers could sell when motorcycle sales cooled off in the winter. Mr. Takeuchi was assigned to lead the project, along with a small group of engineers. This was clearly the group for the job, since Takeuchi and company had been working to develop other new recreational vehicles that never saw production. These projects gave Takeuchi the tools to develop Honda's first ATV, the US 90. In the early stages, a Honda ST70 motorcycle gave up its 70cc four-stroke single-cylinder engine for the cause, along with assorted chassis parts. An extended rear axle carried cultivator wheels designed to handle rough terrain. Two driving wheels in the rear worked well. Cultivator tires didn't. The biggest challenge would be finding a tire capable of getting a grip on soft, changeable terrain such as snow, sand and mud. Two wheels, three wheels, four wheels or more? Motorcycle tires weren't an option. The next phase of development was optimizing the chassis to match the new engine and tires. Testing over rough roads, sand hills and slopes as steep as 35-degrees gradually established chassis dimensions effective for recreational riding as well as agricultural work. Laid out in the shape of an isosceles triangle with the footpegs located outside the triangle to optimize control, the ATC design was unique enough to let Takeuchi patent the arrangement. Exhaustive testing brought other lessons to light as well. Using a thumb throttle instead of the typical motorcycle twist grip let riders shift their weight for optimal vehicle maneuverability while maintaining precise throttle control. A rear differential was considered, but discarded when a live axle performed better. Though suspension is an integral part of the modern ATV, Takeuchi's original balloon tires soaked up rough terrain best by themselves. Exerting less pressure on soft or sensitive terrain than the average human foot, those tires let the vehicle go places others couldn't, leaving little or no evidence of their passing--an advantage that looms large in hundreds of modern ATV applications. .Good as the original fat tires were on snow and sand, they were vulnerable to punctures from things such as stubble from harvested crops. The fact that those original tires weren't repairable compounded the problem, so a fabric carcass was added, and steel hubs replaced the first hubless wheel design in 1975. Tougher, color-impregnated plastic fenders were added in 1975 as well. Moving into the '80s, the two arenas looming largest in the ATV lexicon were utility and racing. The popularity of utility usage was easy to understand. On the farm, a tractor cost exponentially more to purchase and maintain, and an ATV uses 8 percent of the fuel necessary to feed a tractor. Consequently utility usage exploded in the 1980s and ATVs became multi-purpose machines, serving both recreational and utility purposes. This multi-purpose usage grew from 30 percent of total usage in 1985 to approximately 80 percent of today's ATV market. Introduced in 1980, the ATC185 was popular among utility users. Rolling on larger, 25-inch tires that afforded improved traction, the 185 featured a five-speed transmission and automatic clutch and a 180cc four-stroke single-cylinder engine that was considerably more powerful as well. Though designed to split its duties more or less equally between work and play, the 185 set the stage for Honda's first purpose-built utility ATV two years later. The introduction of the ATC250R in 1981 put the rest of the world on official notice that Honda was as serious about winning on three wheels as it was on two. The first true high-performance ATC was powered by an air-cooled 248cc two-stroke, complete with an engine counterbalancer to reduce vibration. Designed for experienced riders, the ATC250R won legions of loyal customers with its adjustable front and rear suspension, front disc brake-both ATC firsts-and a close-ratio five-speed manual transmission. Running unofficially in the 1980 Baja 1000 on pre-production ATC250Rs, a group of Honda associates surprised racing legend Mickey Thompson when they caught and passed him pre-running for the race. Honda's first official ATC racing participation came in the SCORE-sanctioned 1981 Parker 400 held in the Arizona desert. Thanks to Thompson's considerable influence, an official three-wheel class was sanctioned in the 1981 Baja 1000. In 1984, Honda's ATC250Rs started just behind the motorcycles rather than from the very back of the starting order, Honda-backed ATC250Rs finished first and second in class, putting them fourth and fifth overall. Nothing on four wheels finished ahead of the ATCs. The three entries that did well were all large-displacement motorcycles including Honda's race-winning XRª. Honda raised the bar in 1985 with an all-new, liquid-cooled version of the 250R that cranked out 38 horsepower and offered nearly 10 inches of suspension travel at both ends, giving it the power to do disappearing acts ahead of other brands at race tracks across the country. The 1982 ATC200E, a.k.a. "Big Red", had more of everything necessary to get a host of jobs done. Its 192cc engine and five-speed dual-range gearbox cranked out more power, especially low in the rev band, to make chores such as towing, spraying, seeding and fertilizing easier. An electric starter in addition to the standard recoil system made starting the day as easy as pushing a button. Dual racks and a 9.2-liter storage box made carrying tools, hay bales, fencing and other agricultural essentials easier. A new sealed rear drum brake survived the muddy fields and water crossings, and telescopic fork front suspension made a day in the saddle that much more comfortable. Big Red added a reverse gear in 1984, and its drive chain was replaced with shaft drive for extra durability and less maintenance. Though it was never as successful in the desert as the more potent 250R, the ATC200X that debuted in '83 proved that four-strokes could run with the best of them. The 200X combined a high-performance 192cc engine, five-speed gearbox and manual, motorcycle-style clutch with long-travel suspension and sporty chassis geometry that was more at home ripping up race tracks than handling farm chores. Meanwhile, back at the ranch, building ATVs to endure the stress of utility use put Honda R&D on a steep learning curve. Approaching the mid-80s, ATVs were inspected, dissected and exhaustively scrutinized with more data acquisition equipment than any other Honda product. Machines were run hour after hour, day after day for weeks, with riders wearing 50-pound instrument packs that recorded information on every aspect of the machine's operation. As the market's swing toward utility continued, Honda's research made it clear that the next step in the ATV's evolution would be another wheel. Thus Honda's first four-wheel ATV, the TRXª200, debuted in 1984. The market responded almost immediately, making 1984 Honda's biggest sales year for ATVs. The 370,000 units delivered in 1984 remain the high water mark for Honda ATV sales, making up a full 69 percent of total ATV sales in the U.S. that year. The upswing in utility use and the introduction of the four-wheeled TRX200 were also the beginning of the end for Takeuchi's three-wheel matrix. Four-wheelers were considered more versatile tools by customers, and tools were what people wanted most. By 1986 the smart money was all on four wheels in the ATV world. The ground-breaking Honda TRX250R made an un-matched four-wheel performance statement with a liquid-cooled 246cc two-stroke engine similar to the ATC250R's. On the utilitarian end of the spectrum, Honda unveiled the first four-wheel-drive ATV that same year. The FourTraxª 350 4x4 arrived at its coming out party in grand style-lowered from a helicopter to show all four wheels moving under their own power. Market forces were already at work to replace three wheels with four. 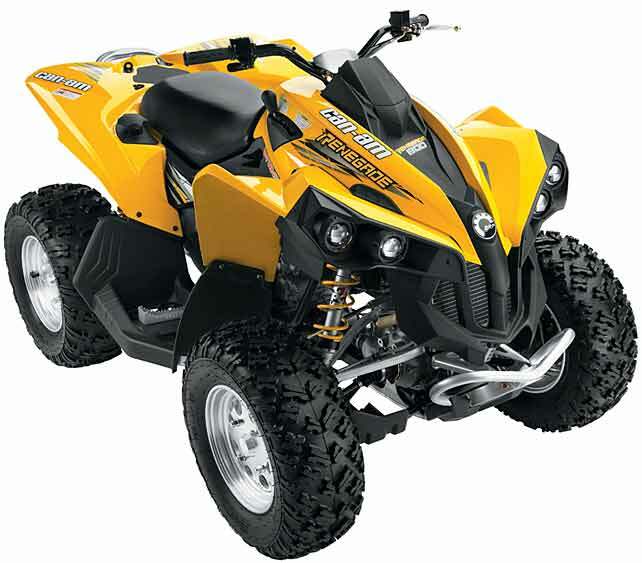 In 1984, skyrocketing ATV sales led to an increase in accidents, prompting an investigation by the Consumer Product Safety Commission (CPSC). In 1986, CPSC statistics suggested that most ATV accidents were due to improper rider behavior that ignored the distributor's warnings. No inherent flaw was found in the three-wheel or four-wheel ATV design. Honda's owner's manuals and product warning labels stressed the importance of proper ATV operation to its customers. Through a national industry safety campaign, there was a 33 percent decline in recorded CPSC injury statistics between 1984 and 1988. Nevertheless, on April 28, 1988, the U.S. ATV distributors entered into an unprecedented 10-year agreement with the CPSC called the Final Consent Decree. Under the agreement, the ATV industry made a $100 million commitment to expand existing safety programs. Among the many components of this agreement, free training and training incentives were offered to owners and purchasers of new ATVs. Additionally, distributors would no longer market three-wheeled ATVs, repurchasing any unsold three-wheel models from dealer inventory. Although three-wheel ATV sales were trailing off across the board at the time, and Honda had already introduced a line of four-wheeled ATVs, the CPSC agreement did serve to accelerate the process. On the eve of the '90s, Honda introduced the 1988 FourTrax 300 and FourTrax 300 4x4, the revolutionary pair of hard working Hondas that would ultimately become the most versatile, most popular ATVs in history. Combining an ideal balance of size, weight, power and capacity, the 300s sold more than 530,000 units over the ensuing 12 years. Powered by an 282cc air-cooled, four-stroke single-cylinder engine, the FourTrax 300 sent its 20 horsepower through a five-speed transmission, automatic clutch and maintenance-free shaft drive. An ultra-low first gear helped it tow up to 850 pounds. Tough steel racks let it carry up to 66 pounds in front and 132 pounds in the rear. And if the hardest working ATV in America ended up packing tackle to your favorite bass fishing spot on Saturday morning, nobody else had to know. From copper mines to banana plantations, golf courses to pig farms, forest reclamation projects to shopping center maintenance, nothing on wheels had ever been as versatile, reliable, efficient and affordable, on the job or on the weekend, as the ATV.